Mira Floors and Interiors offer a great selection of Vancouver carpeting options for both residential and commercial needs. We offer Vancouver carpet flooring installation services throughout and the Lower Mainland, British Columbia. Heat efficiency in the home starts from the floor up and statistically carpet provides the most warmth of any floor covering. It is the most efficient way to add coziness and comfort to a home. Wouldn't you rather step onto nice soft carpet when you wake up in the morning, instead of a cold hard floor? Carpet flooring provides a necessary textural relief, which is increasingly important now that there is an increased focus on clean lines and simplicity in interior design. Carpeting forms the basis of your room. It will affect and set off all other colours and furnishings you choose to put in your home. Carpet offers a large array of choice and can add colour, pattern and of course, texture to your interior design. 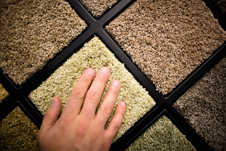 Carpeting your home will soften harsh sounds and create a quieter, more peaceful living environment. As one of the most effective acoustical building materials, carpet will reduce noise generation in two ways - at floor level by cushioning objects hitting the floor, for example footsteps or dropped items, and by absorbing other sounds around your home without reducing the quality of projected sound such as your voice, or music. Contact Mira Floors & Interiors about your Vancouver carpet flooring installation today. It looks great and the installers were friendly and professional. They made sure they gathered up all their tools and extra pieces of carpet. They left me the biggest extra piece of carpet to keep, which was great. Sandy we appreciated you coming out to our house with carpet samples so we could pick the perfect colour. Overlal we are very happy with our experience with Mira Floors.